I’ve been waiting for a while now but last week I took delivery of my first Air Superiority Fighter for the Skean Dhude Air Force (SDAF). Although it isn’t as much a fighter but more of a surveillance drone. It is a Hubsan X4 H107D FPV quadcopter. I was going to wait a buy a fully programmable drone but I seen this one. 100M range, First Person Viewing, a camera on board displays on a screen on the control box and for £100 I was impressed. So I bought it to see what it was like. Arrived very quickly and just needed the drone battery charged via USB charger and AAs for the control box. It was ready to go. The box contained some spare prop blades and a prop protector which I installed. The actual drone itself fits into the palm of your hand. It is so compact. So come time to give it a go. Well I made the mistake of trying it in the back garden first. Took off nicely but it was out of trim so it veered into the garage wall. Oops. Missing one prop blade. Can’t find it anywhere. So opened the replacement set and loaded in the new blade. Another go. This time the trim was a bit better and it went up fine and was easily moved around but I crashed it being smart and steering between some trees, another blade disappeared and I had to replace that. I was very impressed with the quality of the picture sent back to the control unit. It is certainly good enough to see anything you want to see. 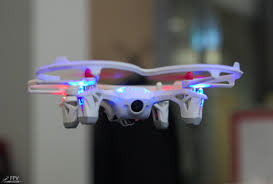 The drone is pretty noisy though as it sounds like a beehive full of bees buzzing away and there are very bright LEDs on the arms which make it extremely visible especially at night it certainly won’t be easy to hit due to its size and the fact that it is quite nimble. You only get seven minutes from a charge which to be honest is enough to cover the range which is quoted at 100m although I suspect that you will only get that outdoors with line of sight. The range will be fine for me. I can use it to view around my house and see what is there. 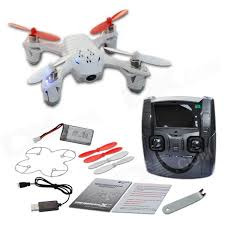 I’ve bought two additional batteries so that if necessary I can get the battery replaced fairly quickly and get the drone back into the action. I could use it to check areas that are out of sight to see if someone is hiding there and being fast and nimble it is unlikely to be brought down by bad guys/ I am considering disabling or replacing the LEDs to make things a little less conspicuous but I will try removing them to save power first and see what happens. I’ve crashed it a few times now and it still seems fine although I have lost prop blades. Not damaged but lost. They just disappear and are never seen again. They must spin away so fast that they travel quite far before coming to ground. I’ve had three crashes, three lost blades and am now grounded until I get some replacements. I’ve ordered several sets from eBay. After playing with it a few days I’ve come to the conclusion that it is a very useful bit of kit for reconnaissance and security and a bargain at £100. However, make sure you get a couple of spare batteries and plenty of spare prop blades. Hovering. That is where it went wrong. Got to keep moving and jigging. It’s nearly 4 times the price and is designed to follow you around while you do stunts and things. I want this to go in front and make sure the way is clear or nosey in at places where I don’t want to have to go..